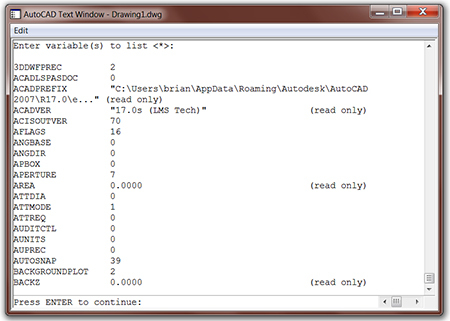 If you’re an AutoCAD user, then sooner or later you will come across “system variables”. I consider these to be a little less intuitive part of AutoCAD, then other parts of the software. Let me explain. If one has a cursory knowledge of AutoCAD, then he would know that the goal of the program is to draw something. Therefore, if for example he hears of the LINE command, then he could pretty well guess it initiates the drawing of a line. In contrast, if he hears of system variables, an explanation is required. System variables are settings that control how certain commands work. They can turn on or turn off modes such as Snap, Grid, or Ortho. They can set default scales for hatch patterns. They can store information about the current drawing and about program configuration. Sometimes you use a system variable in order to change a setting. At other times you use a system variable to display the current status. Okay, this is more information, and definitely helpful. But let’s dig even deeper. But What Does This Look Like? An Example Please!? Step 1. At the Command prompt, enter the system variable name. For example, enter gridmode to change the grid setting. Step 2. To change the status of GRIDMODE, enter 1 for on or 0 for off. To retain the current value of the system variable, press ENTER. At this point I’ve provided a definition and a specific example. I think to round out the discussion on these, I should mention that there are a whole boat load of system variables. It’s probably a good idea for any serious AutoCAD user to cruise through them all at least once. I’m not talking about memorizing them, but just glancing at them. Doing so, in addition to being aware of the definition and an example, would be a good basic foundation of the subject. Step 1. At the Command prompt, enter SETVAR. Step 2. You will then be prompted for the variable name, enter ?. Step 3. You will then be prompted for the variable(s) to list, hit ENTER. At this point you’ve only gotten started viewing the list of system variables. Hit ENTER again, and the next batch of variables will be displayed. You can repeat the process to view all the variables. 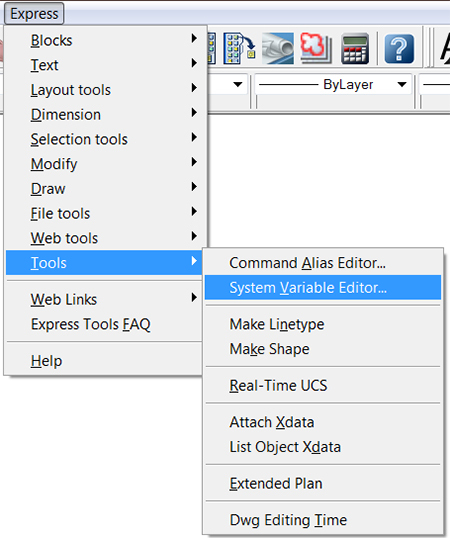 You can do more with the systems variable editor, including saving/backing-up your system variables settings. If you save your system variables settings, you can take them to another machine and easily install them. And lastly, Hyperpics has a page that is dedicated to listing all the system variables. The page includes a chart that indicates which system variables are available in which release, which system variables changed and in which release (on going), and which system variables are new in the latest release. This concludes my overview of the system variables. Happy cadding!! I get how it works, but why does autocad sometimes change a variable at random?